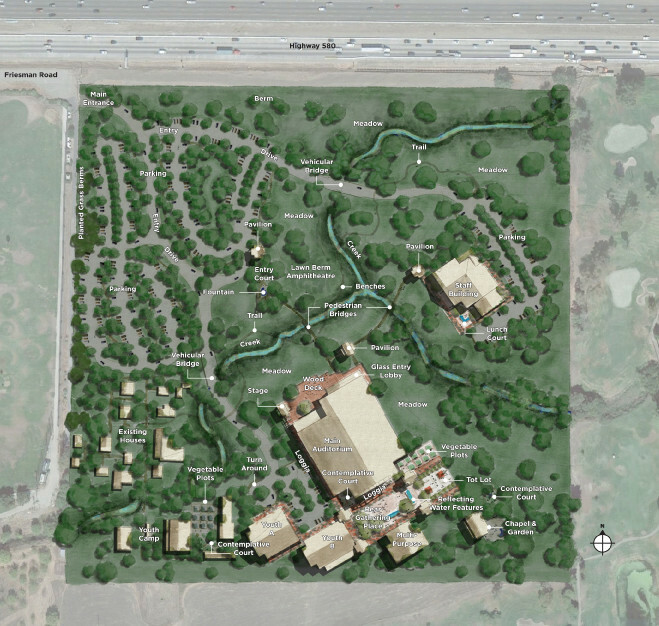 The CrossWinds Church Campus is perched high in a natural setting overlooking an existing, meandering stream and an enhanced, sweeping meadow. Large clusters of informal trees frame vistas onto wildflower pastures, garden courts and gathering places. Views are focused toward significant focal elements. A long, winding drive allows the visitor to experience the grasslands as they approach the campus. The entry drive is nestled in between garden berms, flanked on both sides of the road. Informal drifts of grasses and significant views are experienced both by walking and driving throughout CrossWinds. The visitor will experience the architecture and landscape as one, both sheltered from views of the surrounding access road and freeway. CrossWinds is enveloped by gardens of varying scales and programmed uses; some very private and contemplative, others more public, which are intended to be used as outdoor gathering and performance spaces. The entry lobby to CrossWinds is glass-faced, allowing the experience of the natural grassland meadow to flow into the building. A rich, warm colored wood deck fronts the glass entry, elevated over the meadow, and allows visitors to experience unobstructed, sweeping views of the serene landscape that surrounds the campus. A vine covered loggia system connects and frames the public and private spaces that surround CrossWinds. A simple reflecting pool serves as a focal point for seating places within the rear gathering area. Large sculptural specimen trees spill into the space, providing welcomed shade to visitors.